Today I have something a little different, well I say a little different as this is a blog of everything goes. I was honoured to be selected by InStyle as one of their blog elites *beams*. We was asked to recreate one of their videos with our own twist. You can watch the original Instyle video below. 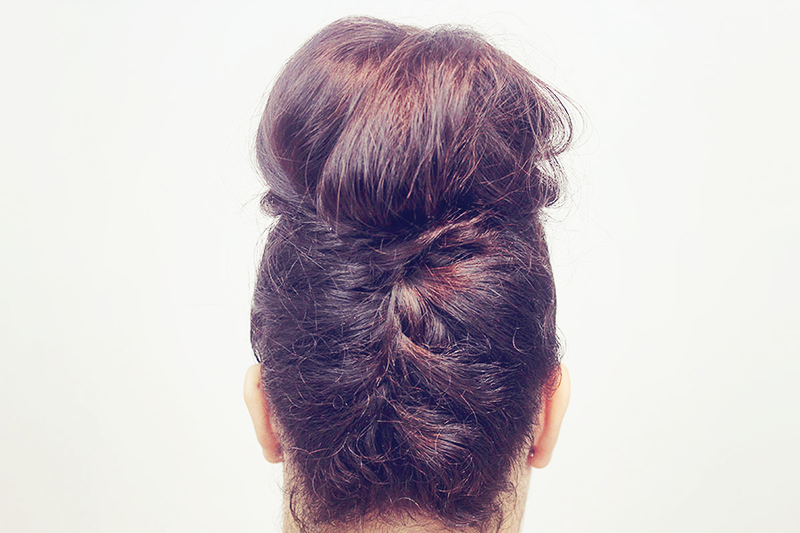 This task, recreate a braided updo. My hair is at an awkward length right now for up-dos but fear not, ye ol' stubborn mule here found one that works for shoulder length hair. It's effortless from the front, turn around and it's gone from effortless to oh wow! Now let me tell you, this was a first time try and by God, it wasn't easy but I have this thing where I won't quit until something is broken, aching, tears have flow or blood has been drawn. Some suggest to do this on second or third day hair, mine was second day hair. I parted across where I wanted the French braid to start and end. This way I didn't continue to gather hair and keep going. Tie the front part of your hair where your bun will be to keep it out the way. You can only do this with your head forward, FLIP IT FORWARD! Say hello to head rush, arm and shoulder workout. Starting at the nape of your neck, section three hair strands with your fingers. Begin a French braid, instead of overlapping pieces on top, they pass underneath. With each section you do, make sure you keep an consistent and even tension, don't do the next section until you are 100% sure. You want the braid to look consistent and secure. Once you've reached the desired peak, I continued to braid the rest of the hair until the end and tied it. Take out the front piece now taking my ghd dressing brush, I began to smooth out the front part of the hair, smoothing it backwards, I take a hair band once happy and tie the plait and front piece together on the top of my head. Now take out the plait. If you are not using additional hair, continue to do your bun, how you chose. I am adding hair to get a bigger bun. You can do your own braided up-do of choice, this could be anything you choose!! Tweet this picture to @instyle_uk with the hashtag #instyleyourway and I will pick my own winner, the braided updo I love the best, wins a fantastic InStyle Best Beauty Buys goodie bag, this includes some products from their hall of fame, Moroccan Oil, L'Oreal to Dermalogica Skincare and Barry M nail polishes!! So what are you waiting for, get braiding, tweeting and sharing. This is such a pretty hair style!